b) Got to the project nugget and searched for below project and installed. c) You can see the list of file in script folders. 7. Defining the same method by using and passing the types into the script. 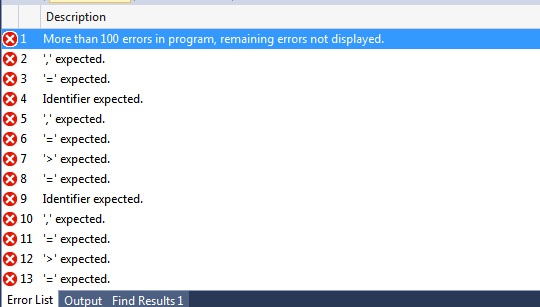 If you return string it will error. - Inheritance in Type script : Derived class is inheriting base class using the Extends keyword. And if you doing the inheritance you need to call the constructor of base class using the super keyword. You can call the base class method also using the super keyword, please see the example below. - Accessors Method in typescript : Writing the get and set method similar to the properties in C#. See the below example for setter method. It can be done by the keyword interface it defining the variable inside of it. As in below interface having the location as parameter, We can pass the more parameter instead of one but should have the location as in parameter. If we don’t have Location than it will give error. Function in Interface : defining the function in interface, typescript allow to define the function into interfaces. Classes can implement the multiple interfaces. It will implements using the implements keyword. If implements the interface need to implement all the variable into derived class. 1. Please see the chapter 1 there are list of the item that we need to install before installing the angularjs with type script. 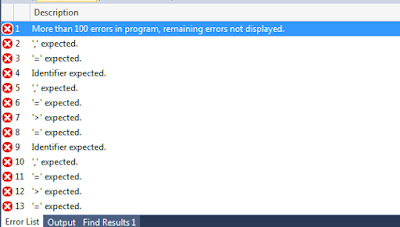 Download the typescript complier from. 2. Now you need to refer all the important flies into index.html to work with it, you HTML page will be look like below. You can see that we have app.ts but we are referring to app.js into our html page. 3. Now in app.ts you need to take the reference as like below. 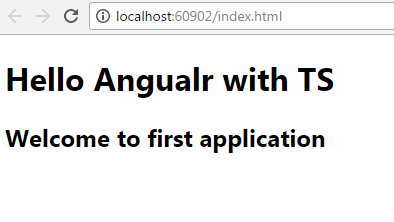 After doing that your angular application will be behave like the type script compatible and now you can create the Angularjs application with the type script code. 5. 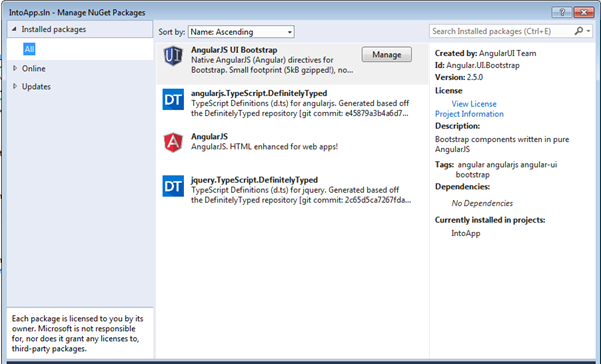 Now creating the angularjs module using the type script module. Creating angularjs Controller using type script. 1. Let’s create one more type script file as main.ts, where we will keep our controller code. 2. 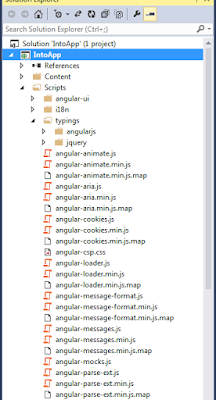 In app.ts we will defined the angular modules. App.ts : take the reference of angular.d.ts; Creating the module for app.project and export it so we can use it out side.